Lunch: Stuffed bell peppers You can make this Italian favorite in less than 20 minutes with this easy recipe. Cut off tops of pepper; remove seeds and white membranes. Discard stems; dice tops fine. Crumble ground beef into a microwave safe colander set in a shallow 1 1/2 quart casserole dish. Add the diced pepper tops, onion, and carrot to colander. Cover loosely with waxed paper, microwave on high 4 to 6 minutes, stirring once, until meat is no longer pink and vegetables are tender. Drain any liquid that's left in the colander, then put meat mixture in a bowl. Stir in rice, 3/4 cup cheese, tomato sauce, and the salt and pepper. Spoon that rice mix into the peppers in the casserole. Cover loosely with waxed paper. 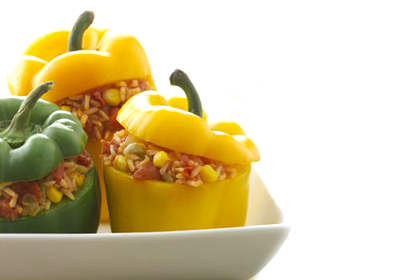 Microwave on high for 11 to 14 minutes, rotating dish three times, until peppers are crisp, tender, and hot. Spoon remaining tomato sauce on top of the peppers, then sprinkle with remaining cheese. Cover and let stand for 6 to 8 minutes until sauce is hot, cheese is melted, and pepper is almost tender. Source: Sanjeev Kapoor, restaurant owner and author of "Microwave Cooking Made Easy"
I have been preparing and eating the omelette in a cup for a while now. Good variations are to add bacon bits and chopped fresh tomoto. BEST ARTICLE!!! thank you so much!!!! I want to try these recipes! Honestly, you have just blown my mind clear out of the water. I thought I was an early adopter (of the microwave? Don't ask. Logic is for losers) of this fixing meals in the nuclear box ... But the recipes I just went through are on level 5,000 and above. I Love you. Thank you for sharing. amazing article! one of the best I've seen on totalbeauty!! !